Superior Cleaning and Restoration Inc. has for years been the one stop solution for Tile and Grout Cleaning services for the people of Coronado. Our team excels at cleaning and sealing all types of stones and tiles. Ranging from marble to travertine, granite to terrazzo, our team of skilled professionals are well trained in the processes of stripping, cleaning and sealing the stone. If it is grout you are looking to get cleaned, we can handle that as well. We clean the grime out of the tiles and leave behind lines that look as fresh as the first time they were laid. Stones, tiles and grout accumulate dirt and cleaning solutions which build up and makes your tile look dirty and appear grimy due to discoloration. DIY solutions will leave you wishing for a more effective solution. This is where we come in, we can even get rid of debris that has collected in the stone pores. Superior Cleaning and Restoration Inc. uses powerful systems that are truck mounted and effective at cleaning out showers, floors and countertops and removing the dirt and debris that has collected inside of them. Our unique method includes a specialized cleaning solution designed to achieve amazing results. Once the work of cleaning your tiles is complete, our technicians will seal to protect the tiles and stones from stains and mildew. 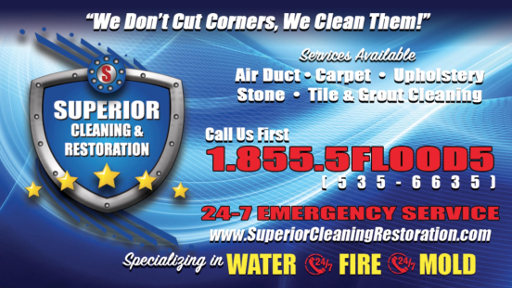 Let us help you revive the former glory of your floors, call Superior Restoration and Cleaning Inc. today.